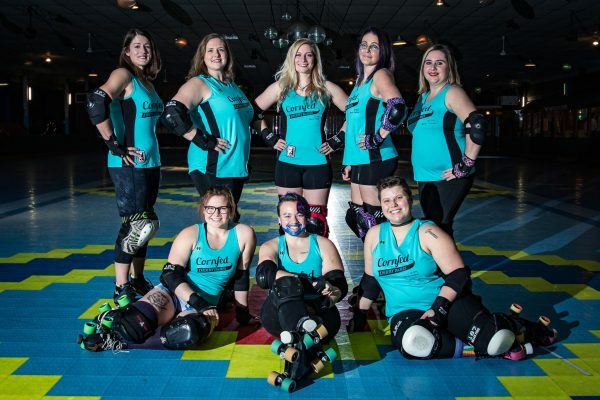 The Cornfed Derby Dames will hold their second bout of Season 9 on Saturday, March 23 at the Delaware County Fairgrounds in the Memorial Building. 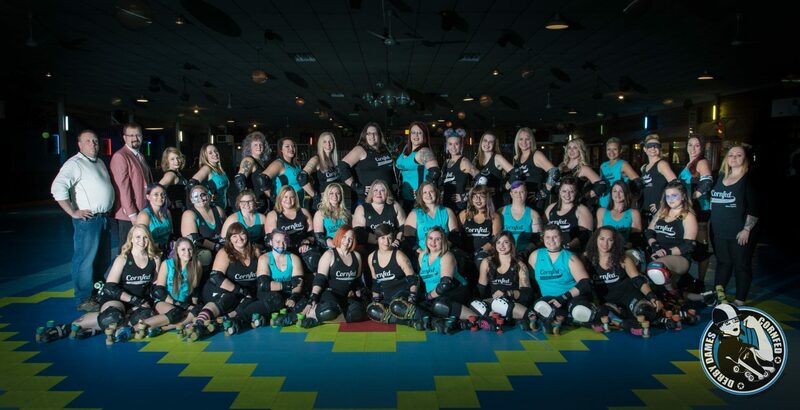 The CFDD All-Stars will take on Hoosier rivals Naptown Roller Derby’s Warning Belles of Indianapolis, Indiana and the Muncie Missfits will play Naptown’s Third Alarm. Doors open for the double header at 5 p.m. with a 6 p.m. start time for the All-Stars game. Tickets at the door are $12 per person (cash or card) or $10 in advance through Brown Paper Tickets or from any Cornfed Derby Dame. Veterans, college students, EMT, firefighters, and police are just $8 with a valid ID and children ages 10 and under are free with the purchase of an adult ticket (limit two children). The Cornfed Derby Dames will hold their Season 9 home opener on Saturday, February 9 at the Delaware County Fairgrounds in the Memorial Building. 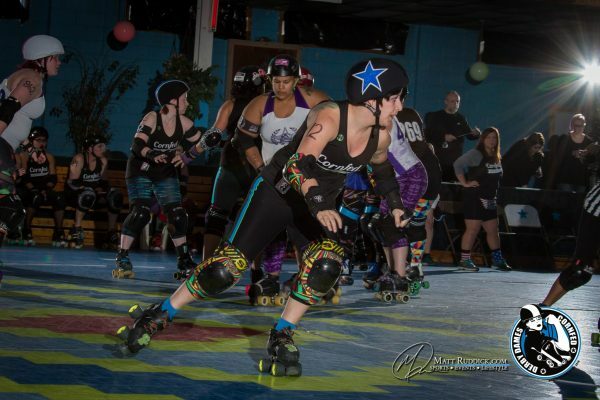 The CFDD All-Stars will take on Steel City Roller Derby‘s Steel Hurtin of Pittsburgh, Pennsylvania and the Muncie Missfits will play Fort Wayne Derby Girls‘ SWAT Team of Fort Wayne, Indiana. Doors open for the double header at 5 p.m. with a 6 p.m. start time for the All-Stars game. Tickets at the door are $12 per person (cash or card) or $10 in advance through Brown Paper Tickets or from any Cornfed Derby Dame. Military, college students, EMT, firefighters, and police are just $8 with a valid ID and children ages 10 and under are free with the purchase of an adult ticket (limit two children). Season tickets for all of CFDD’s home games and tournament are available until January 18 for just $40. UPDATE!!! We are having our next New Skater Clinic on Saturday, Jan. 5, 2019 from 11am-1pm. If you missed our skater clinics, message us on Facebook to learn how you can join mid-season. Trying something new can be scary. Taking that first step into the unknown can be a daunting thing. If you’re considering coming to the New Skater Clinic on Sunday, you might be feeling anxious about it, and second guessing yourself. Just know that you’re not alone. This time last year a group of people were in your same position, and now they’re going to start Season 9 no longer the new kids on the block, but as seasoned skaters. 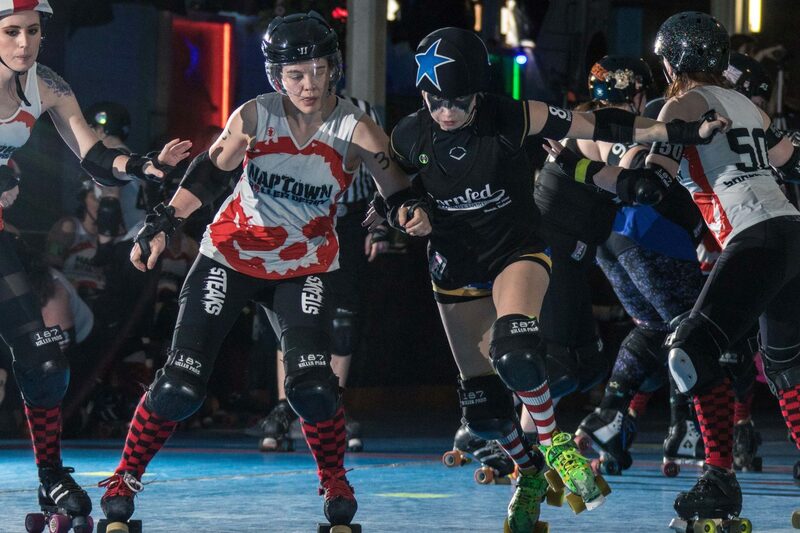 Last year’s new skaters were recently asked some questions about their experiences at last year’s New Skater Clinic, the Bootcamp that follows, and being a member of the Cornfed Derby Dames. Here is what they had to say. Q. What made you interested in going to the New Skater Clinic? Q. How did you feel when you walked into Gibson’s for the Clinic? Q. How did the Clinic go last year? What was your experience or feelings during the Clinic? Q. 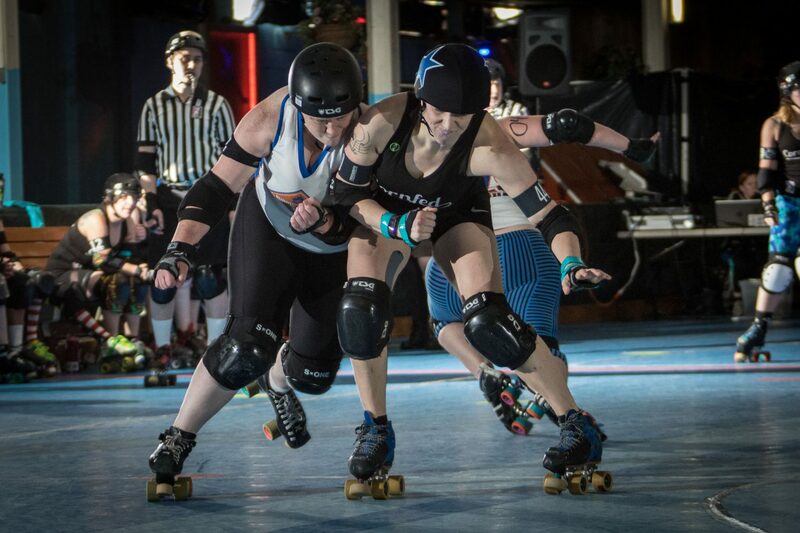 What was your first impression of the Cornfed Derby Dames during the New Skater Clinic and/or Bootcamp (three weeks of practices following the New Skater Clinic where the new skaters continue to learn basic derby skills before the entire league starts practices in October). Q. How was your experience during last year’s bootcamp? Q. 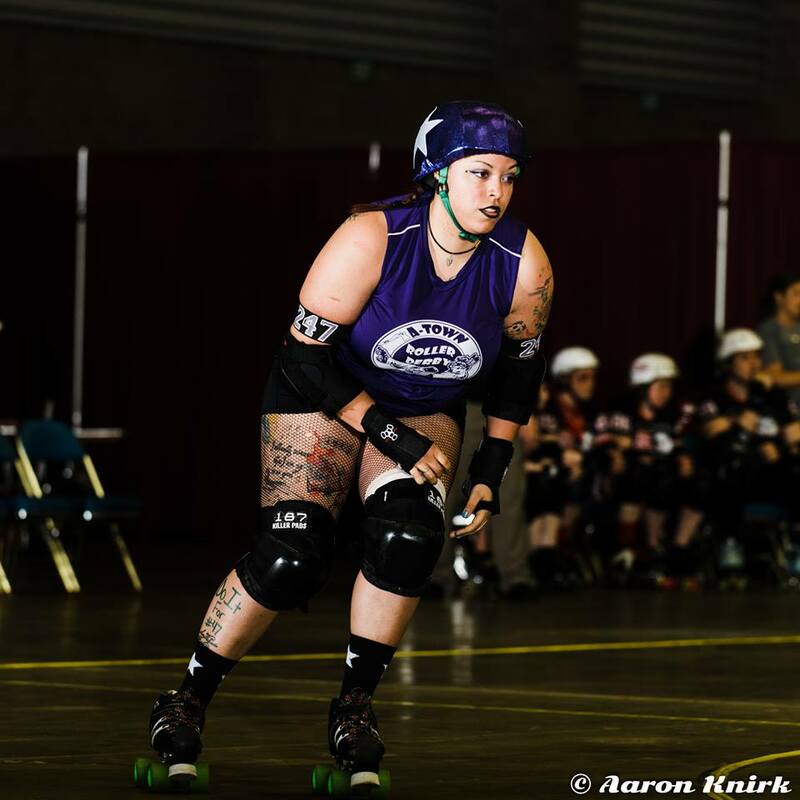 What have you learned in the past year as a member of the Cornfed Derby Dames? Q. 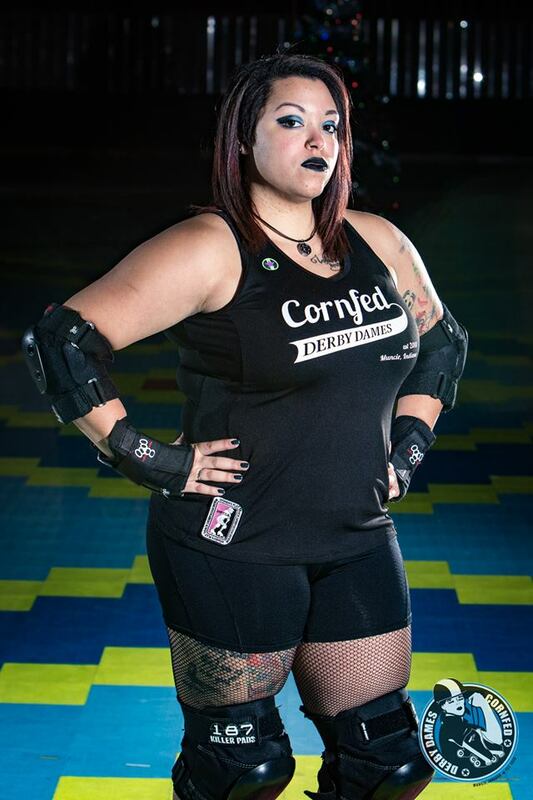 What is your favorite aspect of being a part of the Cornfed Derby Dames? Q. 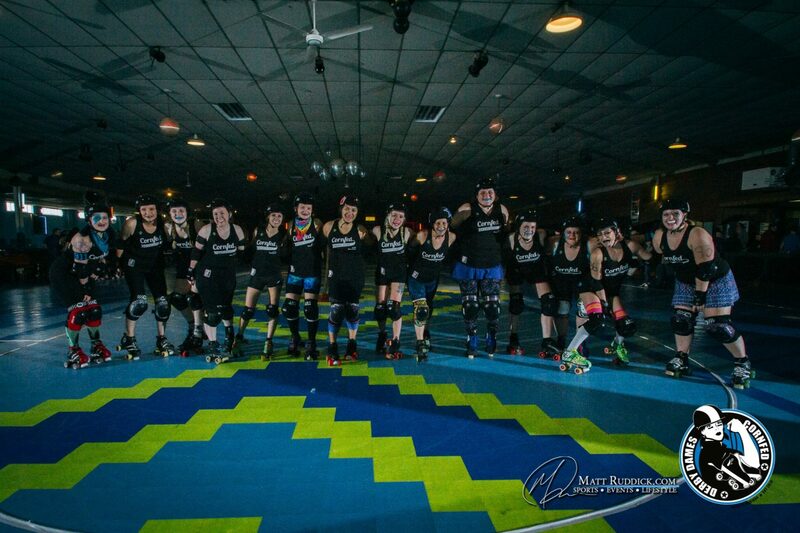 Has your life changed or improved in the past year by being a part of the Cornfed Derby Dames? If so, how? Q. What would you say to someone who is considering coming to the New Skater Clinic this year but is uncertain? This year’s New Skater Clinic will be held at Gibson’s Skating Arena on Sunday, September 9, 2018, from 3-6pm. For more information, including how to register to participate, click here to visit the Facebook event page. 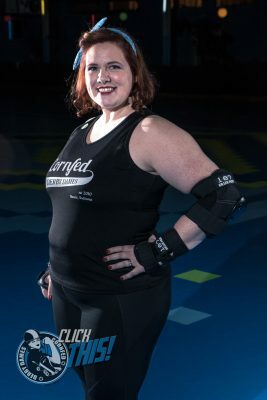 The Cornfed Derby Dames are excited to begin their ninth season this fall and are starting the season off with a New Skater Clinic on Sunday, September 9 from 3 to 6 p.m. at Gibson’s Skating Arena. If you have ever contemplated getting involved with roller derby now is your chance! The clinic is just $10 to attend and does not require any long-term league commitment. If you do choose to join the league, a three-week boot camp will follow the clinic and expand on skating skills before league practices resume in October. Pre-registration is required, to register fill the form at https://tinyurl.com/ybn3nvss. If you have any additional questions about the clinic or borrowing gear email cfddrecruitment@gmail.com. 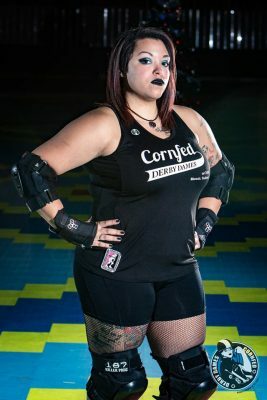 The Cornfed Derby Dames will host the first ever Smalltown Smackdown roller derby tournament on Sunday, June 24 at Gibson’s Skating Arena. This all day event will kick off at 9 a.m. with the final game starting at 7:30 p.m. The Smalltown Smackdown: Cornament of Champions will feature Cornfed’s Muncie Missfits, Derby City Roller Girls’ Bourbon Brawlers of Louisville, KY,Fort Wayne Derby Girls’ SWAT Team, Gem City Roller Derby‘s Violet Femmes of Dayton, OH, and the South Bend Roller Derby’s Studebreakers. The tournament will take place at Gibson’s Skating Arena, 2610 S. Mock Ave. Doors will open for the first game at 8:30 a.m. but fans are welcome to arrive throughout the day. Tickets will be available at the door for $20 per person until 3 p.m. when tickets will be reduced to $12 per person. College students, military personnel, veterans, firefighters, and EMT’s are just $15 with an ID or $10 after 3 p.m. Children 10 and under are free with the purchase of an adult ticket (limit two children). Volunteers are needed for the event, if you are interested in helping please reach out to Cornfed at cornfeddd@gmail.com. Snacks and non-alcoholic beverages are available at the concession stand. A portion of all bout proceeds in 2018 will be donated to A Better Way Services, Inc.. This will be the final home event for the Cornfed Derby Dames Season 8. Information about recruitment events, clinics, boot camps, and scrimmages will be available in the fall. Our All-Stars team has definitely been feeling the effects of having KarmaKazi play with Cornfed. Karma joined us this fall as a transfer, which she says was “a bit daunting, but Cornfed has welcomed [her] with warm open arms.” We’ve all been happy to get to know her fun personality, great attitude, and merciless hits. 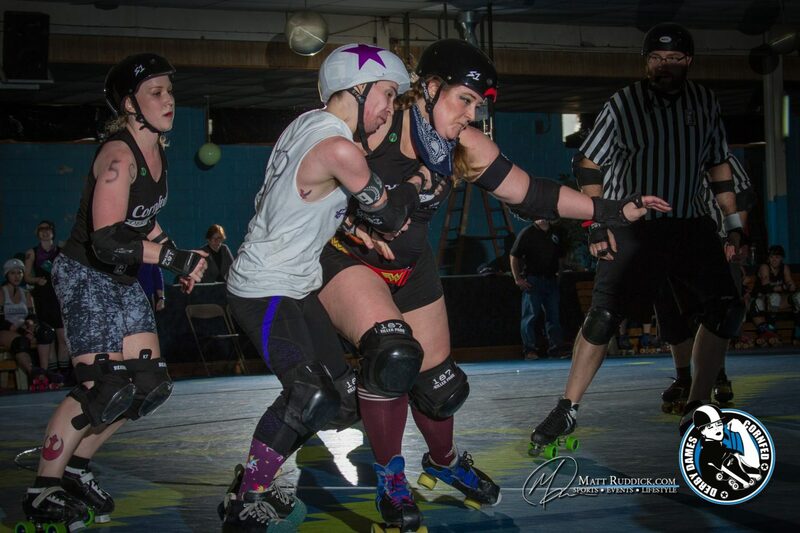 As a blocker, Karma reminds jammers that they’ll always get back what they dish out–and more. 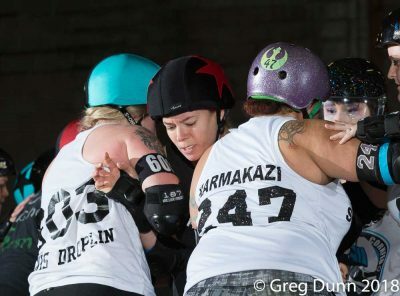 KarmaKazi started skating in January 2015 with A-Town Roller Derby. 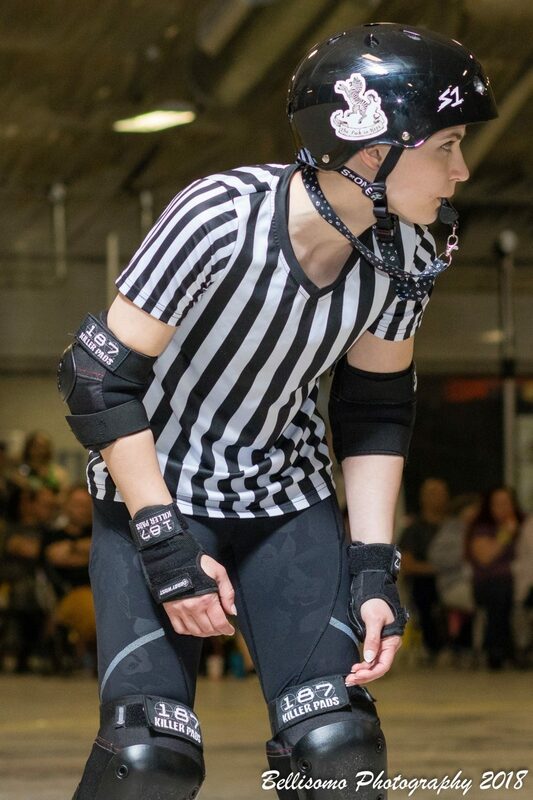 She says that she fell in love with roller derby “immediately, even though [she] could barely skate!” Her skills have grown rapidly since then, and she gives credit for that to the supportive roller derby community, which she says is her favorite part of roller derby. 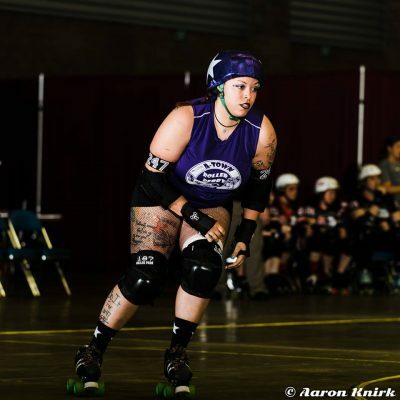 Many roller derby players choose their name based on people they admire, traits they have, or another activity they love. Karma chose her name for different reasons, though. She says that she “wholeheartedly believe[s] in Karma,” and wanted a name to reflect that. So she “added a little pun action and BOOM, there she was.” And, since Karma–the concept and the skater–can come for you at any time, her number is 24/7. When Karma isn’t stopping jammers in their tracks, she works as an office assistant at Caregiver Homes in Indianapolis. She also works at Tangram, Inc. as needed as a Direct Service Provider, where she “provide[s] direct support and care to individuals with intellectual and developmental disabilities.” Karma also enjoys “reading, watching movies, and The Arts,” and spending time with her Dad and younger siblings–who have never missed one of her home games! 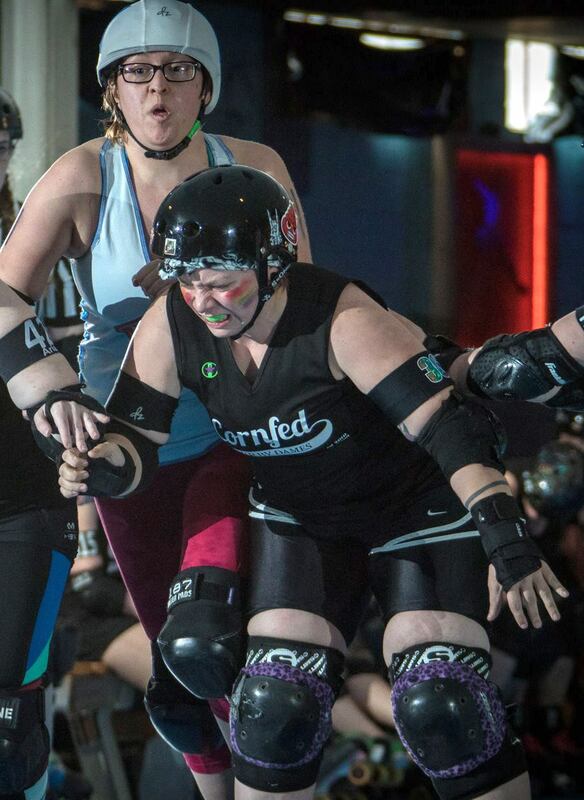 When asked about how she’s feeling about Cornfed’s 8th season, Karma said that she’s “super stoked!” She said that “It’s wonderful to be a part of such a talented, strong group of humans who push and support each other! I see great things happening, not only during this season, but many more to come!” We can definitely see Karma doing great things this season, too, as she pursues her goal of continuing to improve and pushing herself even harder. She even hinted at potentially getting back into jamming, which should scare any blockers that are going to play the All-Stars this season! Make sure to come see KarmaKazi in action at Cornfed’s Season Opener against Naptown on February 25th at Gibson’s Skating Arena! Tickets are $10 in advance through Brown Paper Tickets and $12 at the door. This doubleheader starts at 2 PM with the All-Stars versus the Warning Belles, later, the Missfits will play the Third Alarm. You won’t want to miss seeing Karma teach jammers that what goes around, comes around.